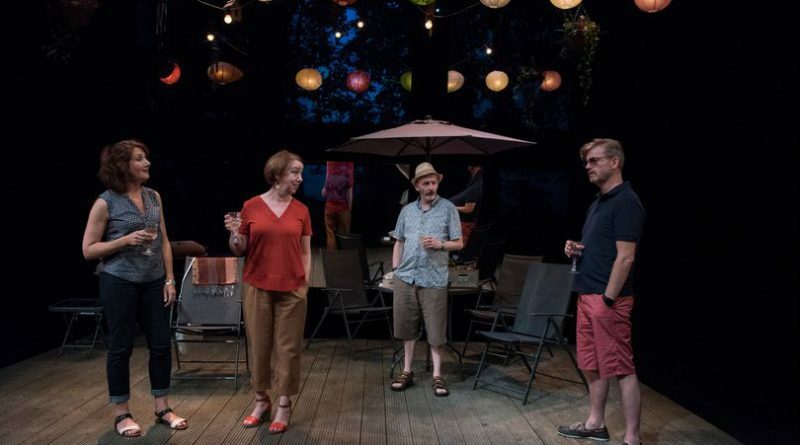 WE all yearn to be loved but no matter how much we wish for an impossible dream, playwright Owen McCafferty dissects the hidden truth behind friendship. 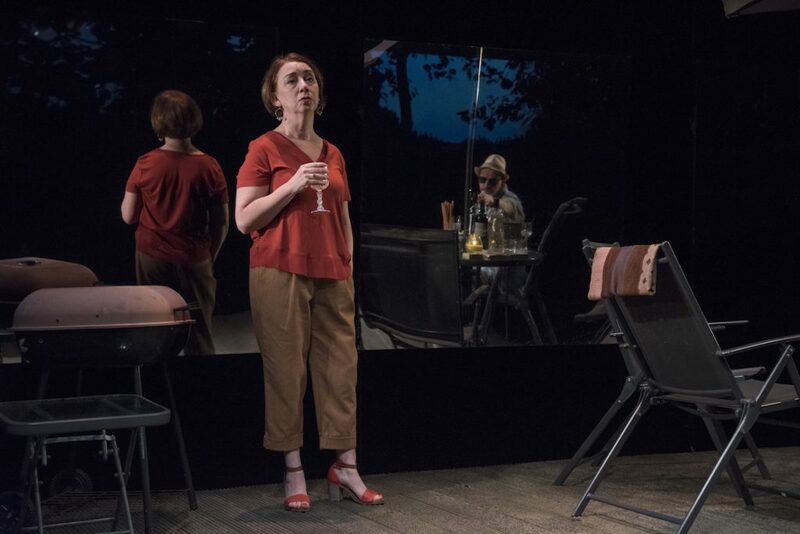 The stunning Fire Below (A War of Words) – offers the Peacock stage audience at The Abbey Theatre a delightfully comedic pill to swallow, followed by a poisonous injection, as the veneer of friendship between protestant and Catholic neighbours wears away. The backdrop for this thought provoking play is Belfast 20 years after the Good Friday Agreement, on the most politically charged night of the year, July 11, when the Protestant community sets fires, burning symbols of Catholicism within the flames. 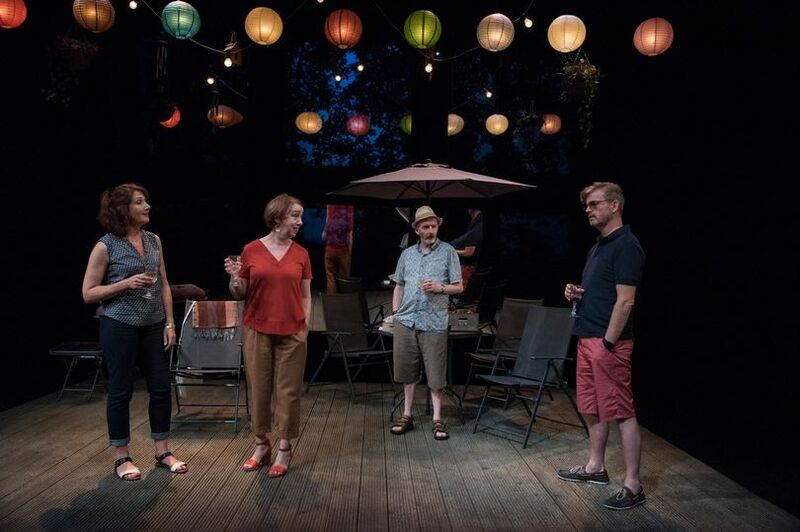 We find two couples enjoying the evening in the heart of a middle class street as they look down from the garden decking on their working class neighbours below preparing to ignite one such fire. On first assumption it would seem the friends are all Protestant but as the play progresses and old wounds emerge, it becomes clear the hosts, Gerry and Rosemary, are Catholic while visitors, Tom and Maggie, are Protestant. For a time, as the neighbours enjoy the irony of the 11th and it’s historical inclination to sever friendships between the two religions, it seems middle class stoicism has won over. Neither couple wants to admit holding allegiance to the church they were born into. And both instead mock the working class below for being “uneducated” and making themselves an ignorant spotlight for the world. 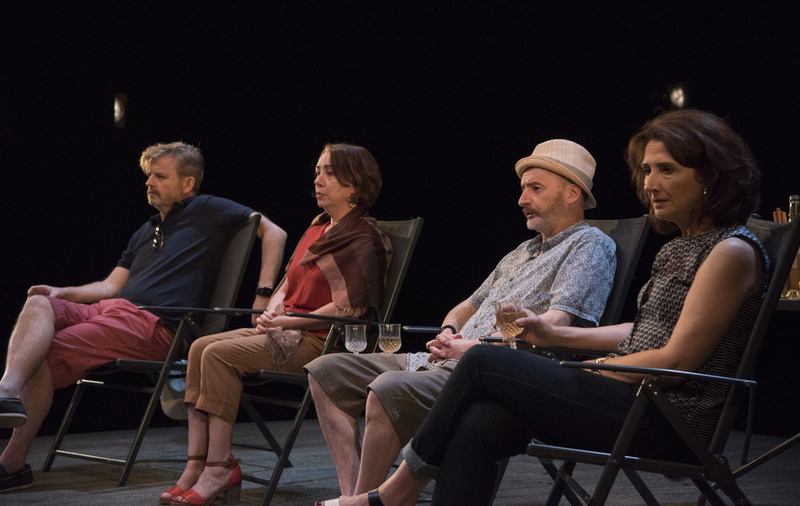 Ruairi Conaghan, Cara Kelly, Frankie McCafferty and Ali White in Fire Below (A War Of Words) by Owen McCafferty at the Peacock Stage, The Abbey Theatre, Dublin. Both couples are aggrieved that such a tumultuous event could shape the image of Northern Ireland globally when friends such as they seem to sit comfortably on the outskirts of the politics that’s ravaged their individual histories. Education and wealth have secured their place on their throne for the evening, the decking of a middle class garden, where they look down upon the great unwashed below. Only later do we realise the fire is not being set below at all. The friends have convinced themselves that so advanced is their modern thinking, that they are removed from sectarianism and hatred. After all, Tom has chosen to learn Irish but even this small peace offering to all Catholics in the North, falls short because it irks his Catholic friend, Gerry, who admits he’d be viewed as a Republican should he learn Gaelic. But he did take his family to an Ulster match and that was his own symbol of resolution, he admits. “You won’t be talking Irish with him all night?” Gerry remarks as he prepares the snacks for his guests ahead of another evening which will see his wife, Rosemary, a fluent Irish speaker, flirting with her new protege. The tensions have been revealed with masterful subtlety and the rift continues to grow as Rosemary tries to sit beside Tom and winds up dancing with him, as he comments how graceful she is in Irish. Though he cannot speak Gaelic, Gerry knows his friend is flirting with his wife and demands to know what was said. As the couples get more intoxicated it’s clear though the fire below is a disappointment, the real fireworks are going in the middle class garden as a debate arises on the Israel-Gaza conflict. 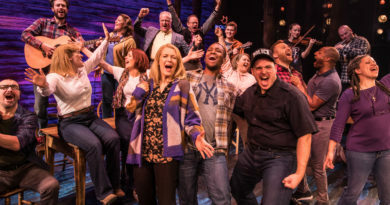 Maggie comments how she’d always wanted to visit Israel and opens a discourse on the conflict which sees Tom unite with his wife for the first time in the evening as Gerry and Rosemary, grow closer as they denounce Israel. Gerry compares Israel’s military actions in Gaza as being akin to a boxer repeatedly punching a baby who’s packed in a room full to the brim of other babies. And finally the fire has been lit – here in the garden. Tom and Maggie turn on their friends, calling them personal insults, referring to their Catholicism, while fending off the assault, Gerry accuses Tom of being from “Finchley” in London, such is his love of England. And it may have been a flirtatious language for the pair to begin with but now Irish is a verbal weapon to insult Tom and his wife as they storm out of the garden. “Why were you shouting in Irish?” Gerry asks Rosemary, as the pair, shell shocked from the row, sit down. “I wanted to insult them in Irish,” she admits, looking bereft at the loss of her friends. Cara Kelly as the forlorn Rosemary and Frankie McCafferty as the defiant Gerry. Moments pass and though he wishes to stay on in the garden to look to the sky, away from the Protestant one below, Rosemary is wounded and changes in to her dressing gown readying herself for bed. She has lost something more than friendship. She fears she’s lost a man who lights a flame within her, a feeling extinguished with time in her own marriage. “You look beautiful,” Gerry says, hoping to ignite something once again. “Stop,” Rosemary responds coldly. Though united they stand in the face of politics and religion, it seems nothing more burns between the pair. We leave our broken friends, as Tom and Maggie stride back into the garden and sit down once again. It seems nothing has unfolded at all, no trouble, no sparks – but the friends’ faces give the game away. They are all wounded but in true Irish fashion, perhaps a drink can heal wounds, old and new. Rosemary pours the couple a drink and though staggered, the conversation begins again. “You don’t even know where Finchley is,” Maggie says to Gerry. “It’s in London,” he responds. “North west London,” Rosemary adds. Divided, yet together, the couples try to reach their own middle class agreement. The only disappointment for onlookers is that this one hour drama could not run just a little longer. A Fire Below (A War of Words) runs at the Peacock Theatre, part of the Abbey Theatre, Dublin until November 18. Tickets are available here or contact the box office on 01 87 87 222.